Earlier this month, Google surprised us with OnHub, a $200 WiFi router made in partnership with TP-Link that looks great and packs in some smart technology (even if it only has one ethernet port). 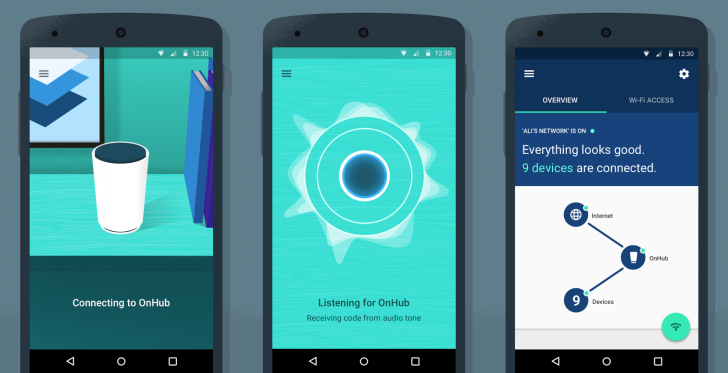 We knew Google planned to release an app to pair with and control the OnHub, and today Google On hit the Play Store. The app appears to be super straight-forward, guiding users through initial setup with a variety of simple, pleasing illustrations, and - after that - allowing for easy troubleshooting, speed testing, and network sharing. Users can also rename their network or change the password, and the app even has a feature to "remotely provide or receive help from friends and family." On's interface relies on shades of blue and teal that should be familiar to OnHub customers, matching the device's body and glowing light (assuming you went for the blue version). Of course you'll have to wait for your OnHub to arrive before you can really use the app, but it looks to be a simple and pleasant experience so far, with a pleasing design to boot.